PORTABLE SOLAR PANELS — Sun Power RV - Go Power solar panels, inverter kits, battery sales and installation for RV, motorhome, and yacht. PORTABLE 80 and 120 Watt Solar Panel Kits come complete with everything required to keep your batteries charged. 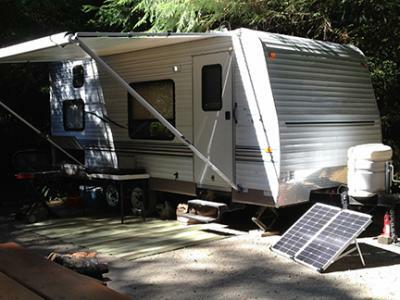 This is the easiest way to add solar power to small RV trailers, tent trailers, Chalet trailers, and all RVs that are parked in the shade. The only installation required is installing the quick-connect to the battery terminals. Once that is complete the quick connect makes it a snap to add your PORTABLE solar panel to the batteries. Portable 120 at the beach. Stay parked in the shade. Portable 80 charging a Chalet. Includes a heavy duty nylon case, solar controller, battery clamps, ring terminals, quick connect cable, 15' of cable, connector cover. Free phone consultation for PROPER instalLATION OF the quick connect to your batteries.